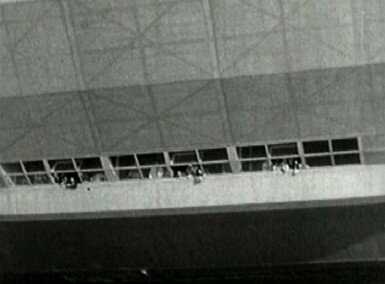 The passenger accommodation aboard Hindenburg was contained within the hull of the airship (unlike Graf Zeppelin, whose passenger space was located in the ship’s gondola). 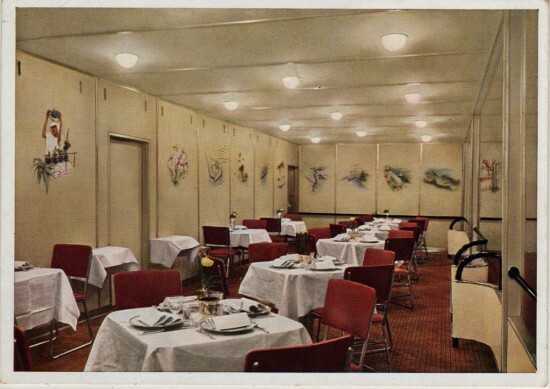 Hindenburg’s “A Deck” contained the ship’s Dining Room, Lounge, Writing Room, Port and Starboard Promenades, and 25 double-berth inside cabins. 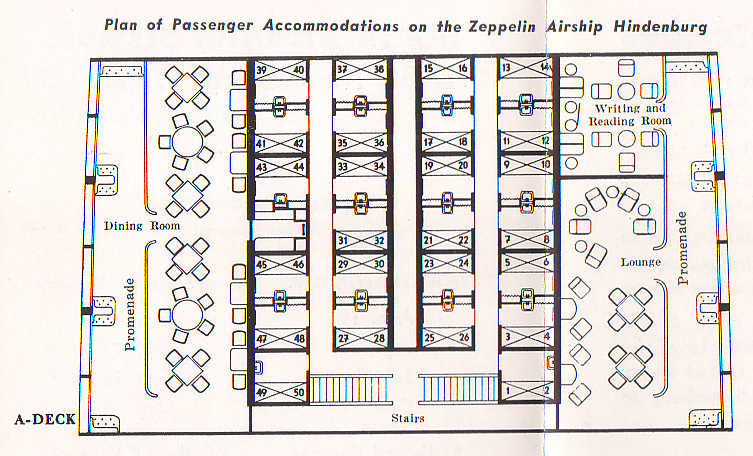 The passenger accommodations were decorated in the clean, modern design of principal architect Professor Fritz August Breuhaus, and in a major improvement over the unheated Graf Zeppelin, passenger areas on Hindenburg were heated, using forced-air warmed by water from the cooling systems of the forward engines. 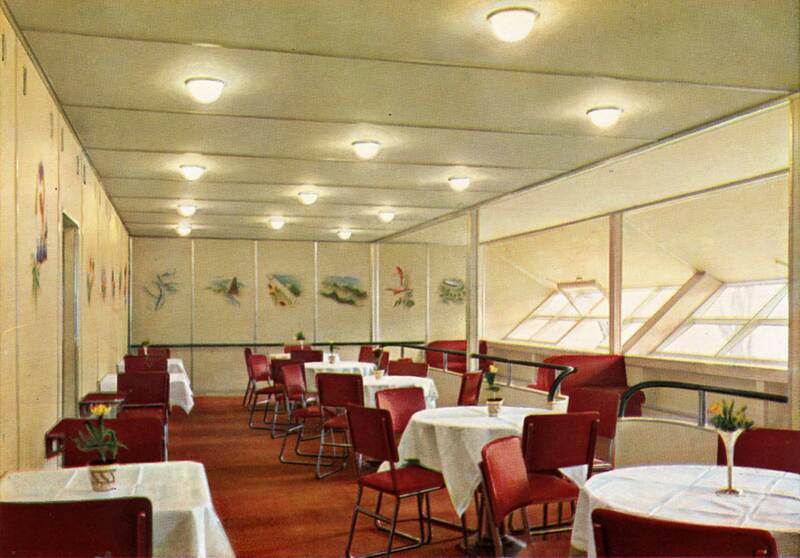 Hindenburg’s Dining Room occupied the entire length of the port side of A Deck. 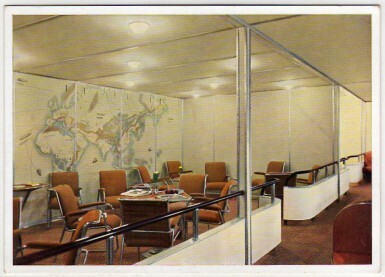 It measured approximately 47 feet in length by 13 feet in width, and was decorated with paintings on silk wallpaper by Professor Otto Arpke, depicting scenes from Graf Zeppelin’s flights to South America. The tables and chairs were designed by Professor Fritz August Breuhaus using lightweight tubular aluminum, with the chairs upholstered in red. 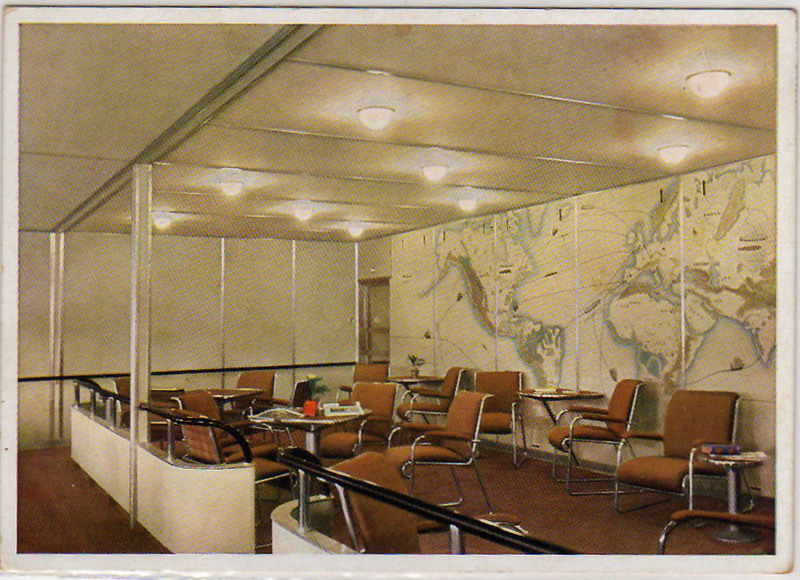 On the starboard side of A Deck were the Passenger Lounge and Writing Room. 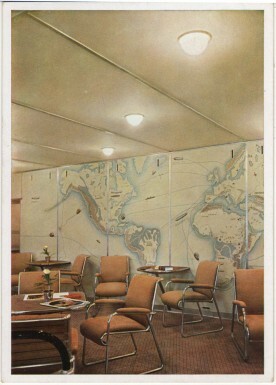 The Lounge was approximately 34 feet in length, and was decorated with a mural by Professor Arpke depicting the routes and ships of the explorers Ferdinand Magellan, Captain Cook, Vasco de Gama, and Christopher Columbus, the transatlantic crossing of LZ-126 (USS Los Angeles), the Round-the-World flight and South American crossings of LZ-127 Graf Zeppelin, and the North Atlantic tracks of the great German ocean liners Bremen and Europa. 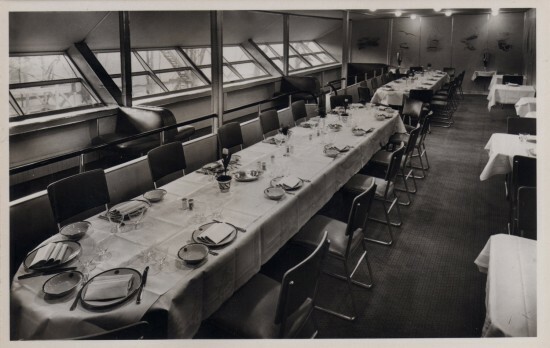 The furniture, like that in the dining room, was designed in lightweight aluminum by Professor Breuhaus, but the chairs were upholstered in brown. During the 1936 season the Lounge contained a 356-pound Bluthner baby grand piano, made of Duralumin and covered with yellow pigskin. Next to the lounge was a small Writing Room. 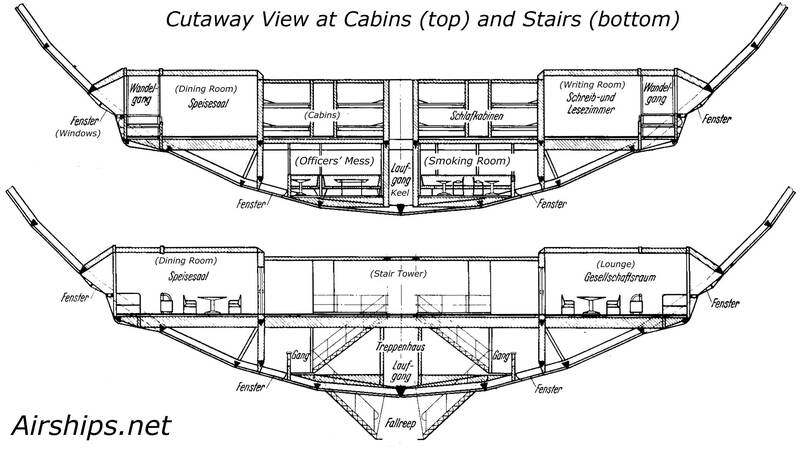 Hindenburg was originally built with 25 double-berthed cabins at the center of A Deck, accommodating 50 passengers. After the ship’s inaugural 1936 season, 9 more cabins were added to B Deck, accommodating an additional 20 passengers. 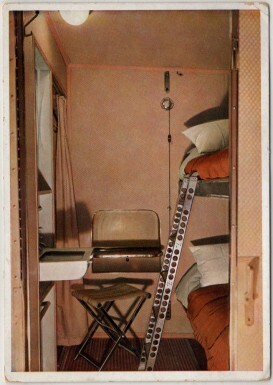 The A Deck cabins were small, but were comparable to railroad sleeper compartments of the day. The cabins measured approximately 78″ x 66″, and the walls and doors were made of a thin layer of lightweight foam covered by fabric. 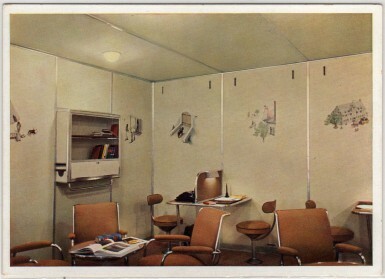 Cabins were decorated in one of three color schemes — either light blue, grey, or beige — and each A Deck cabin had one lower berth which was fixed in place, and one upper berth which could be folded against the wall during the day. 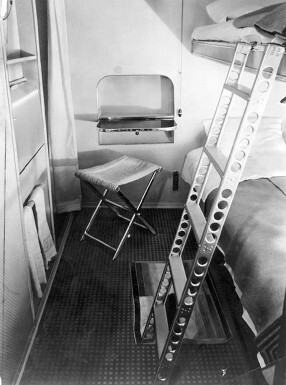 Each cabin had call buttons to summon a steward or stewardess, a small fold-down desk, a wash basin made of lightweight white plastic with taps for hot and cold running water, and a small closet covered with a curtain in which a limited number of suits or dresses could be hung; other clothes had to be kept in their suitcases, which could be stowed under the lower berth. None of the cabins had toilet facilities; male and female toilets were available on B Deck below, as was a single shower, which provided a weak stream of water “more like that from a seltzer bottle” than a shower, according to Charles Rosendahl. 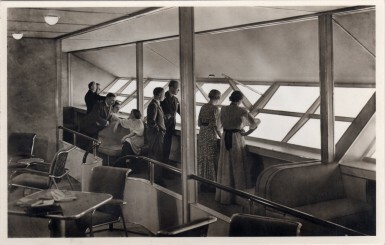 Because the A Deck cabins were located in the center of the ship they had no windows, which was a feature missed by passengers who had traveled on Graf Zeppelin and had enjoyed the view of the passing scenery from their berths. Promenades On either side of A Deck were promenades, featuring seating areas and large windows which could be opened in flight. 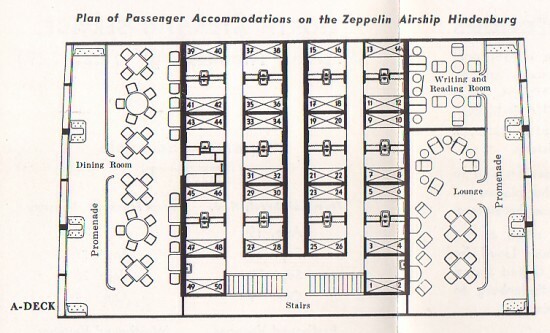 B Deck on Hindenburg, located directly below A Deck, contained the ship’s kitchen, passenger toilet and shower facilities, the crew and officers’ mess, and a cabin occupied by Chief Steward Heinrich Kubis (containing a door to the keel corridor, which was the only connection between passenger and crew spaces). During the winter of 1936-1937, while the ship was laid up in Frankfurt, additional passenger cabins were also added in Bay 11, just aft of ring 173. The new cabins had windows offering an outside view, and were slightly larger than the cabins on A Deck. The additional weight of these new cabins was made possible by the unexpected (and unwelcome) need to operate the ship with hydrogen, which has greater lifting power than the helium for which Hindenburg had been designed. 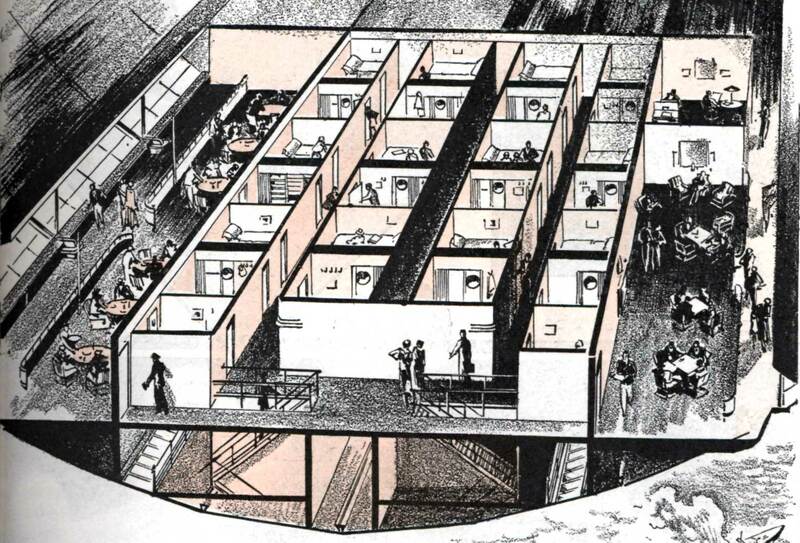 Perhaps most surprising, aboard a hydrogen airship, there was also a smoking room on the Hindenburg. 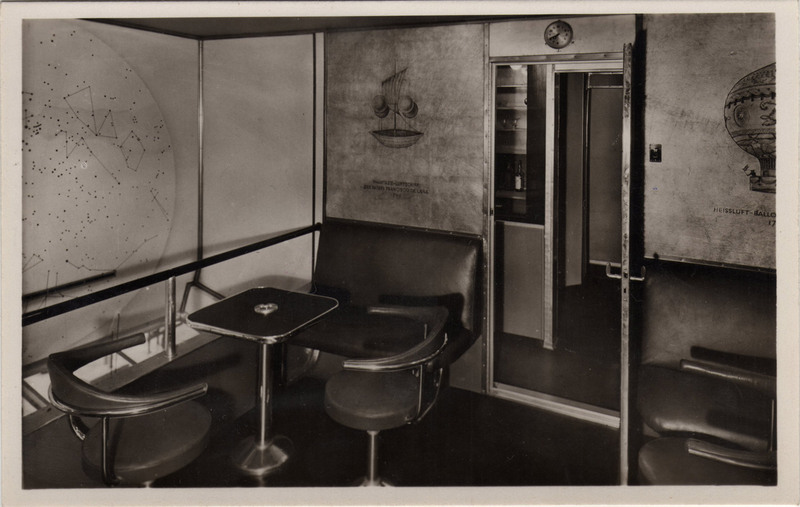 The smoking room was kept at higher than ambient pressure, so that no leaking hydrogen could enter the room, and the smoking room and its associated bar were separated from the rest of the ship by a double-door airlock. One electric lighter was provided, as no open flames were allowed aboard the ship. 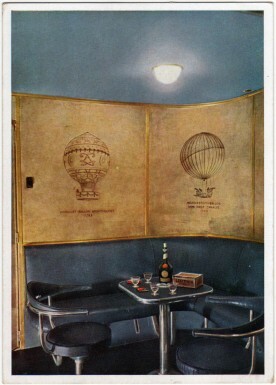 The smoking room was painted blue, with dark blue-grey leather furniture, and the walls were decorated with yellow pigskin and illustrations by Otto Arpke depicting the history of lighter-than-air flight from the Montgolfiers’s balloon to the Graf Zeppelin. Along one side of the room was a railing above sealed windows, through which passengers could look down on the ocean or landscape passing below. 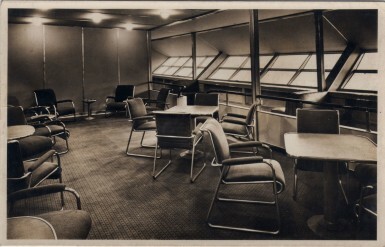 The smoking room was perhaps the most popular public room on the ship, which is not surprising in an era in which so many people smoked. 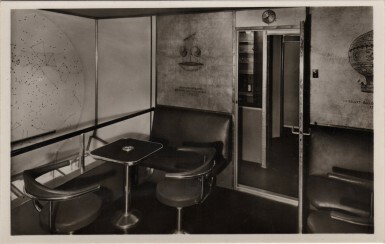 The Hindenburg’s bar was a small ante-room between the smoking room and the air-lock door leading to the corridor on B-Deck. 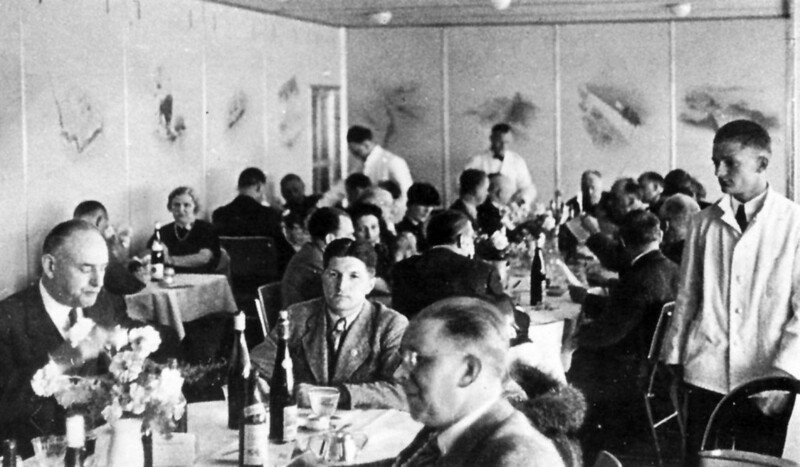 This is where Hindenburg bartender Max Schulze served up LZ-129 Frosted Cocktails (gin and orange juice) and Maybach 12 cocktails (recipe lost to history), but more importantly, it is where Schulze monitored the air-lock to ensure that no-one left the smoking room with burning cigarattes, cigars, or pipes. 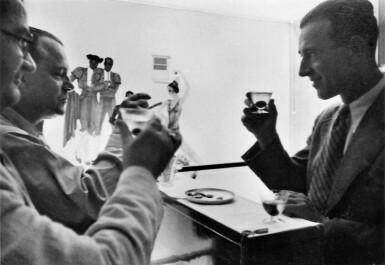 Schulze had been a steward and bartender aboard the ocean liners of the Hamburg-Amerika Line and was well liked by Hindenburg passengers, even if he was surprisingly unfamiliar with basic American cocktails such as the Manhattan. 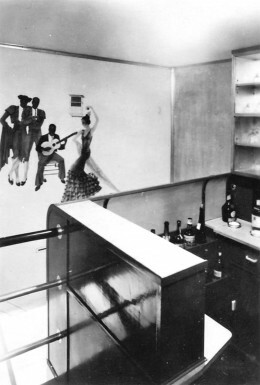 The bar and smoking room were also the scene of a raucous party on the Hindenburg’s maiden voyage to America, where passenger Pauline Charteris improvised a kirschwasser cocktail after the ship ran out of gin for martinis. The same type of ashtray can be seen in the color photograph on the table in of the smoking room. The ashtray is seen with a cigar on top of it. Unfortunately the ashtray in the photos you sent me has no connection to Hindenburg. 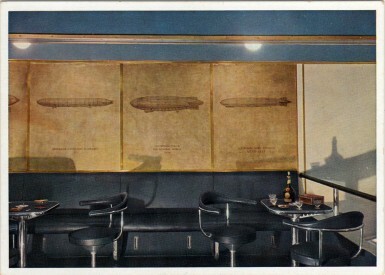 The Zeppelin Company made a variety of metal consumer products that were completely unrelated to airships in the years between the wars in order to stay in business and keep the company alive. If you are wondering why I am asking the question of how much square footage was A and B deck combined, it’s because I am currently researching and designing airships within logical grasp. Thank you again, as I love your site! Hi Dan, I had a question when seeing this, how much square footage space was A and B deck combined? Thank you. I also wrote in your Graf Zeppelin, statistics section. Hydrogen isn’t even that dangerous. If a terrorist wanted to do maximum damage, there are plenty of more effective and cheaper options. And hydrogen wasn’t the only culprit in the Hindenburg disaster. More conductive paint would have prevented the static buildup and prevented the disaster entirely. Unless it was sabotaged as the captain declared. This airship made multiple flights prior to the last one. And it conveniently began burning upon approach for landing. Reason they were using hydrogen is because there was an embargo on Helium from the US, the main source of the gas. Automobile cigarette lighters were electric. They’ve perplexed me for a long time, too. I would guess that they were ventilation slots between the sectioned areas of the ship. This would explain away the absence of such slots between the lounge and writing room, as both were adjoined by a large, open promenade. Enlarge the two passenger cabin photos. The slots appear to be fasteners. It seems to me that some of the wall panels are removable. 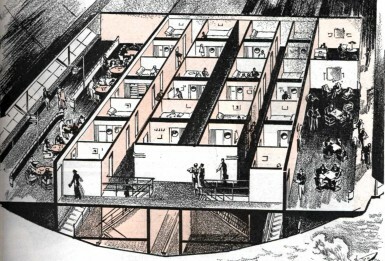 Maybe some of the floor plan was changeable. My German-American (Deustchamerikaner) grandfather’s cousin, Helmut Lau was a Helmsman on the Hindenburg and lived. love to hear more about Helmut Lau, anything you would be willing to share. i know he had some stories to tell. hope to hear from you and thanks.